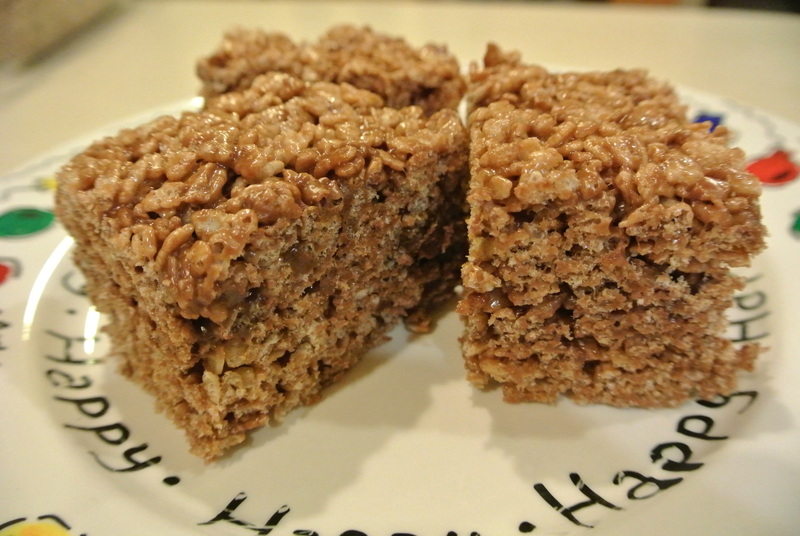 I love rice krispy treats! Not the thins ones, either. I like them thick. As in a double batch in the same size pan as a single recipe thick. I always add vanilla and extra marshmallows, too. On more than one occasion I have had a child tell their mother, “Mom, her’s are so much better than yours.” Most have asked me what I do different; only one got upset. As I went to the pantry to get the ingredients for a fresh batch, I spotted a jar of Nutella. “That could be really good.”, I thought, “Let’s try it!” I didn’t use enough Nutella or vanilla on the first batch. The second turned out divine! Melt butter & marshmallows in large heavy pot over medium heat. Add in Nutella until blended. Stir in vanilla. Mix in cereal until well blended & coated evenly. Press into 9×13 pan that has been sprayed with cooking spray. All to set for an hour then cut into squares. * I use wax paper that has been sprayed with cooking spray to press treats into pan.